ERLAN ABDYLDAYEV, Minister for Foreign Affairs of Kyrgyzstan, said that perpetual instability, increasing disputes among leading world Powers and the absence of a clear vision for a future world order had enabled terrorist and extremist groups to fill the vacuum and influence the world situation. In that context, strengthening human rights and the rule of law were ever more relevant. Those principles were an integral part of his country’s development. Indeed the upcoming parliamentary and presidential elections would strengthen its democratic foundations. To that end, he requested the international community’s help in implementing its far-reaching goals. He also reiterated the country’s candidacy for the Human Rights Council for the 2016-2018 period. The most serious external challenge to Central Asia, he said, was the situation in Afghanistan, and the illegal trafficking of its drugs. He called on the international community to strengthen the capacity of regional law enforcement agencies and promote regional cooperation. Another important factor in regional instability was unresolved border issues. Their resolution would facilitate regional transit potential, the development of cross-border infrastructure, economic improvement and decreased social tension. He called on all Central Asian States to support his President’s initiative to develop and sign bilateral agreements on confidence-building concerning borders. 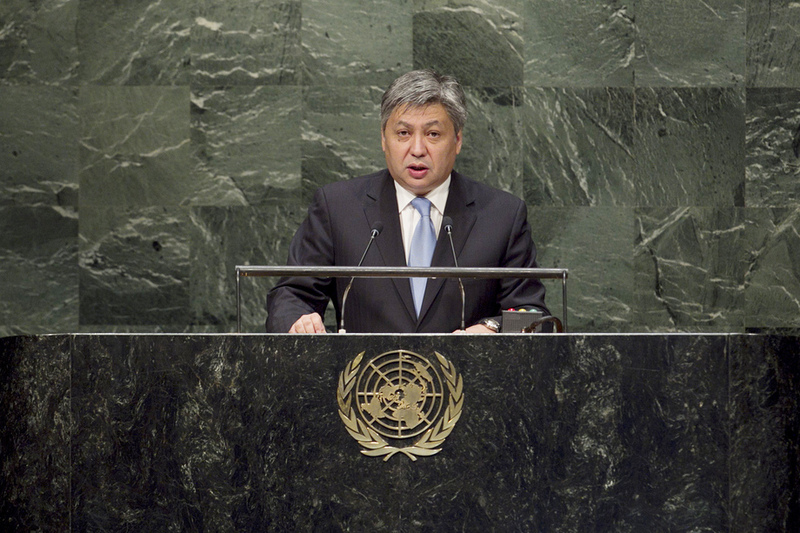 As a landlocked, mountainous country, Kyrgyzstan’s development had been restricted by its remoteness, lack of access to major international transport networks and its particular vulnerability to climate change, he said. An international development fund to provide assistance to developing landlocked countries would be beneficial. Recognizing the links among the environment, climate and sustainable development, he said vulnerable countries’ interests must be addressed adequately in future global actions. Further, the linkage between water resources and energy made developing hydropower a prerequisite for sustainable development. The issue of affordable energy should be reflected in the post-2015 agenda. The restoration and security of uranium tailings in Kyrgyzstan was a serious transboundary problem for Central Asia, he said, calling for assistance in solving the problem of radioactive and toxic waste.